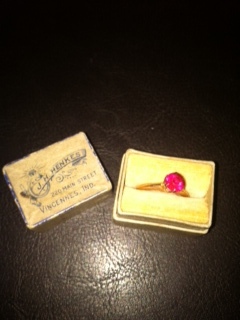 I inherited a ring from a relative who died more than 40 years ago. I don't recall ever meeting her, but I am told that she was very wealthy. Given the era in which she lived, and research about the J.H. Henkes company, I believe the ring is likely from the mid to late 1800's. It has alway been referred to as a ruby, but I do not know for sure that it is. 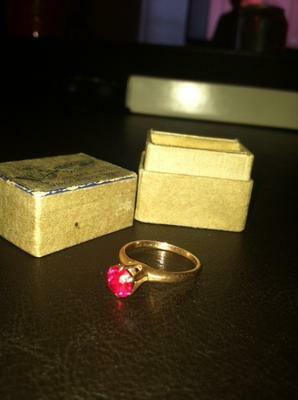 The ring is still in its original box, from J.H. Henkes in Vincennes, Indiana. The inside is engraved with "08 10k." I have no idea if it is real or synthetic; the latter of which I hear was relatively common, especially during the late 1800's. I understand there are many factors that affect a gemstone's worth....size, clarify, etc. But....Do you have any idea about how much it might be worth? What is the best approach to getting a reliable estimate....jeweler, antique dealer, other? Thanks so much for lending your time and expertise.